I cannot help liking manhole covers. In fact they feature in quite a few of my blog posts. In October 2010 I wrote: They are reminders that the pavement is not only a floor but a roof – the roof of a busy world of tunnels, tubes, chambers and canals; of light, electricity, water and workers. Manhole covers are shutters on the skylights in this roof. 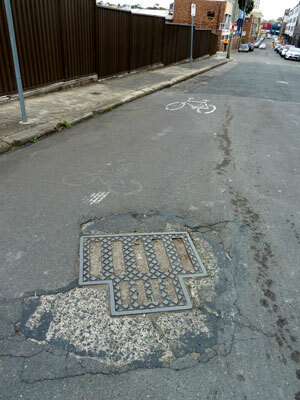 Manhole cover holding together a dilapidated road in Camperdown (Sydney). Photo: meganix 2013. But why do I persist in calling them manhole covers? I am usually careful about using gender-neutral language, and there are alternative terms available – service cover, access hatch, maintenance hole, for instance. Although part of the answer is inertia – that’s what I’ve always called them – there is also the desire to align myself with a loose but international oddball fraternity of people who find aesthetic satisfaction in manhole covers. They admire the dull sheen of worn cast iron, remark upon the distinctive municipal manhole embellishments in Japan, take rubbings from old street covers and reproduce them in knitted bedcovers, and photograph tiny weed gardens growing in the patterned indentations. If ‘manhole’ had not been part of my vocabulary I might have missed Mimi and Robert Selnick’s lovely book of black and white photographs, Manhole Covers. 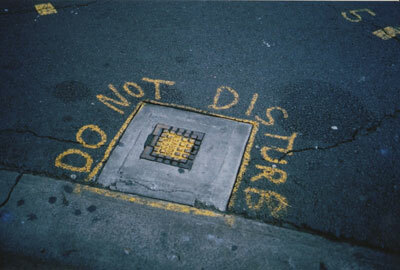 I certainly would not have found one of my all-time favourite websites, Tim Pitman’s Misplaced Manhole Covers. Worse still, people interested in manhole covers would never find my site. LOOK RIG, Sydney. Photo: meganix 2010. Anyway, does it really matter that we call them manhole covers? It’s an established term in the English language. My copy of the Macquarie Dictionary (Revised edition 1985) defines ‘manhole’ as a hole, usu. with a cover, through which a man may enter a sewer, drain, steam boiler, etc. And there you have it. Why does their name need to be gender inclusive? It’s men who use manholes because it’s men who do the dirty work underground. That was the entrenched opinion of many people when Andy Mitchell, the chief executive at Thames Tideway Tunnel, recently announced that he wanted to achieve gender parity by the time construction of London’s ‘super sewer’ was finished in 2023. There was a response of disbelief because, after all, this is a distinctly unglamorous construction project in a ‘man’s world’. Andy Mitchell, chief executive of Thames Tideway Photo: Matthew Joseph/Thames Tideway in The Guardian 10 December 2014. Browsing around a bit more I found a string on Yahoo! Answers/Social Science/Gender studies in response to the question ‘Why don’t women often choose jobs such as coal miner sewer worker etc. are these jobs unfeminine?’. While most replies were ill-informed, anti-woman and/or anti-feminist rants, there were some interesting thoughts amongst them. One person wrote that those dirty, dangerous, unhealthy, jobs are called ‘glass cellar’ jobs. Feminists, he maintained, are only concerned with the ‘glass ceiling’, and look to the top in an attempt to shame society into giving women ‘positions of power’. They should also be looking at getting equal positions for women at the bottom. Men choose those jobs because they pay well as a trade-off for safety and comfort. In reply to others who insisted that women won’t do dirty jobs, one man wrote, “In my former metropolitan area, the Labor Council and many of the individual unions sponsor a program to recruit and train more women for labor jobs. With no exceptions, whenever they open the books, every single available spot is grabbed by a woman looking to get in”. A couple of years ago, the Daily Mail reported that two young women were to become the first females in Britain to start an apprenticeship in waste. The newspaper’s headline read ‘The pay’s OK but the hours stink’. Looking for an alternative to office work, these women applied for a position with South West Water where their jobs would involve visiting sewerage works, hand-raking raw sewage, taking samples for testing and using rods to clear blockages. Change, of course, isn’t always easy. A New York Daily News article sub-headed ‘They work in the sewers all day, but they say the really nasty stuff wasn’t in the pipes – it was in the locker rooms’ tells the story of two woman laborers for the city’s Department of Environmental Protection, who have withstood years of threats and insults from male colleagues treating the agency as ‘a man’s world’. The pair claim that they were denied overtime and promotions, and that the few other women in the agency were driven out by constant harassment. 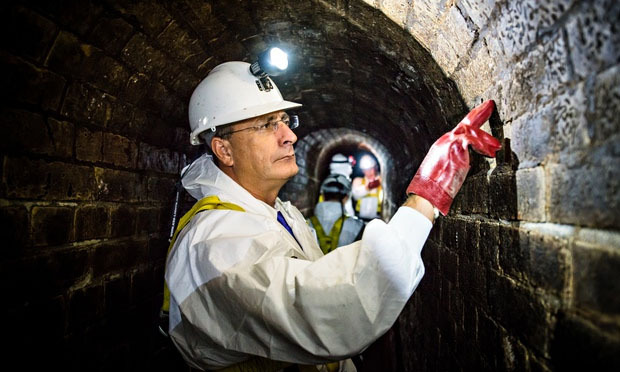 But, as Andy Mitchell continues in the Thames Tideway article, ” From my first day in the job, I knew this was a place where we could achieve something different which would leave a legacy for generations about how good the construction world can be. This is not really a man’s world: we need women, and we need diversity […] We are working to create a culture that finds out from women themselves what they want and how they think we can attract their counterparts. It’s not a bunch of blokes sat around a table making assumptions on why we think women don’t want to work in construction. We are finding out the true obstacles so that we can we try to overcome them”. 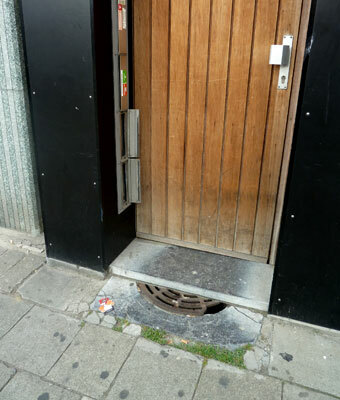 Cellar grate under front doorstep, Antwerp. Photo: meganix 2013. Back to manhole covers, then. Baden Eunson tells us that ‘manhole’ is a restricting name that reinforces traditional gender roles. Such terms are examples of the ways in which the English language reinforces patriarchy. Other examples include spotlighting (male nurse, career woman); dimunitivisation (actress, waitress); differential naming (Mr Smith and the girls from Accounting); and featurism (Prime Minister Julia Gillard wore a little black dress and a collarless blazer with olive green sleeves when she gave her farewell speech). Eunson’s article on ‘Gender-neutral communication: how to do it’ was published in a recent issue of The Conversation. Amongst speakers (or writers) who persist with masculinely-loaded language, some do so because they are openly opposed to all this feminist nonsense and what they think it stands for. As for the rest, some are fuddy-duddies who do not want to put effort into changing old habits. Others do not want to sound conspicuous amongst peers who normally use non-inclusive language. Of course, even amongst these people, I think there are those whose resistance to gender-neutral language is really an indicator of their resistance to gender equality, even if they won’t admit it to themselves. Where does that leave me and manhole covers? Down amongst the fuddy-duddies, I suppose. Since I intend to go on photographing these enduring items of street furniture, it is up to me to find a term for them that I can use consistently and comfortably – ‘cast iron street covers’, perhaps. But I will probably still include ‘manhole covers’ in the list of tags and keywords for relevant posts, in the needy hope that this will bring some extra hits and likes. 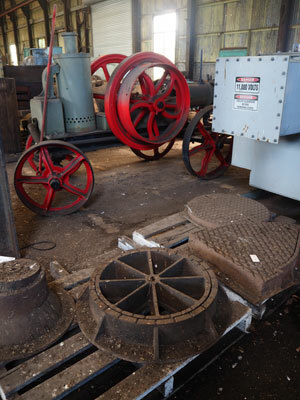 Last resting place for cast iron service covers — Sydney Water’s Movable Heritage Store, Potts Hill (Sydney). Photo: meganix 2015. Melnick, Mimi & Robert Melnick, Manhole covers, Massachusetts Institute of Technology, 1994. Today is the anniversary of the launch of this blog. It was on 3 May 2009 that I wrote the first post and welcomed readers to Pavement Graffiti, “where asphalt rules and grey is good. 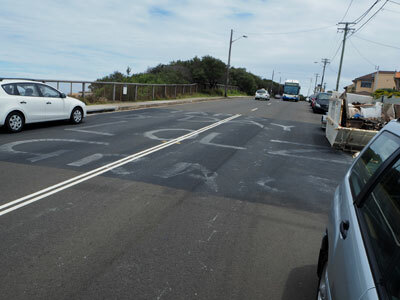 The focus is on roadways and footpaths, and ‘graffiti’ means anything written, drawn, scrawled or stencilled on them”. 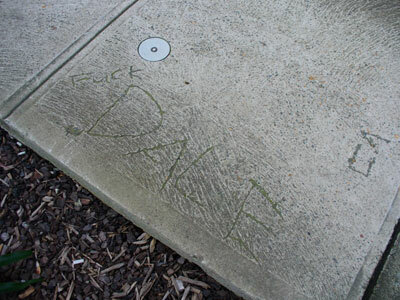 Back then I had embarked on a PhD at Macquarie University, also titled Pavement Graffiti. Six years on, the PhD has been achieved, there is a gallery of images on-line at Pavement Appreciation and a Facebook page of the same name, academic articles have been published, magazine articles too. From time to time journalists stumble upon the blog and ask my opinion about graffiti, Eternity or, as happened this week, walkable cities. The blog does not have a huge following but I am grateful to those who have given long-standing support or have simply shown a fleeting interest. My interests have broadened to encompass a concern for the disappearance of strange spaces, areas of decay, and layered sites under the pressure of urban renewal (or urban homogenization). I am now an Adjunct Fellow of the Urban Research Centre at the University of Western Sydney. But I still retain my fascination for the pavement and am currently waiting to hear if my article on ‘Imagining the pavement: a search through everyday texts for the symbolism of an everyday artefact’ has been accepted for publication. Watch this space. 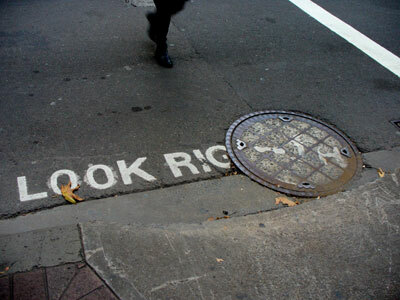 And do, please, continue to enjoy the literary adventure of reading the street beneath your feet. 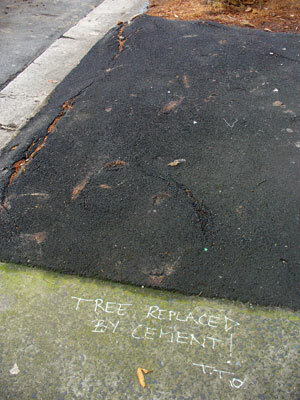 Pothole marked for repair, Newtown, 2008. Photo by meganix. “It’s kind of sad that it’s mostly famous people who get exhibitions and accolades. “Gautier rightfully gets his time in the sun, but what about other people who have contributed to society in some of the less glamorous fields? Wouldn’t you love to see an exhibition tracking the life of a road worker? “Someone who goes around fixing potholes and other structural problems in the roads. “Imagine the before and after shots of carefully repaired roads, a map pinpointing all the achievements and major works over the years. Glebe (Sydney), 2004. Photo by meganix. Dave O’Neil, ‘Man about town: celebrities are not the only ones who deserve an exhibition about their life’, Sydney Morning Herald, 13 February 2015, The Shortlist, p.2. In Sydney’s Angel Place, Michael Thomas Hill wants us to experience longing for nature long since lost and destroyed. His ‘Forgotten Songs’ installation charms us with its hanging bird cages and piped calls of native birds. But the sting is on the roadway where brass plaques inform us that the birds we are listening to “once sang in central Sydney, before Europeans settled and gradually forced them away”. The list of bird names inscribed there is like a wartime honour roll that we should follow along the laneway, lest we forget. 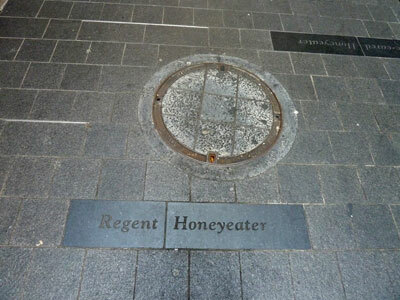 The name label for the Regent Honeyeater is coincidentally positioned beside a manhole cover that, if opened up, would reveal the Tank Stream coursing beneath the lane in its modern-day guise as a stormwater pipe. Not only have trees been felled, Hill is reminding us, but the natural features of the landscape have been obliterated by the pavement itself. But be careful what you want us to wish for, Michael. Regret the loss of charming songbirds and what do we get instead? 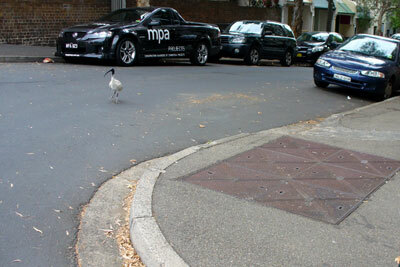 Squadrons of honking ibis – swampland birds that have flown back from the countryside to learn the art of city living. Street smart and urban savvy, these scavengers revel in consumerism’s cast-offs. Michael Thomas Hill’s ‘Forgotten songs’ installation belongs to a class of text-laden public artworks on the pavement that reproach us for wrongdoings past and present. I have written about these in an article called ‘Words of regret’ in Issue 3 of Sturgeon magazine, which has just hit the stands. 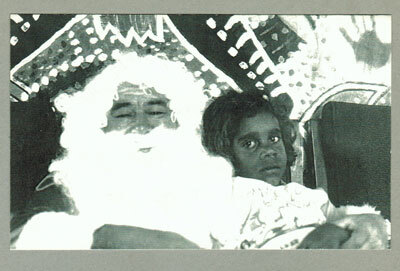 Black Santa was an Erskineville man, Syd ‘Doc’ Cunningham, who used to distribute presents to rural children every Christmas. 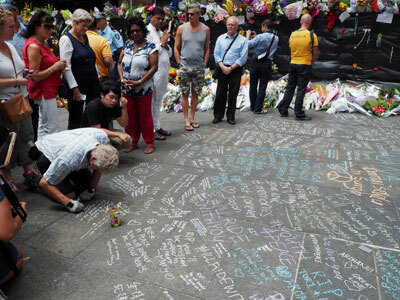 Syd would sit outside the Woolworths supermarket in King Street, Newtown, collecting money and toys throughout the year. Around Christmastime he would give a Christmas card to people who dropped money in his bucket. After Syd died in 1999 a bronze plaque was installed at the spot where he used to set up his folding table. On it was a depiction in relief of his plastic bucket. 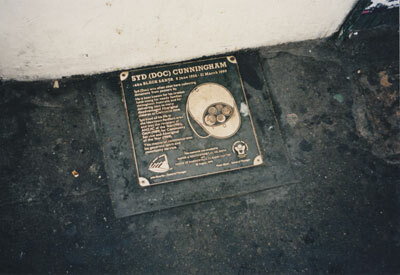 Syd (Doc) Cunningham plaque, King Street, Newtown (Sydney), 1999. 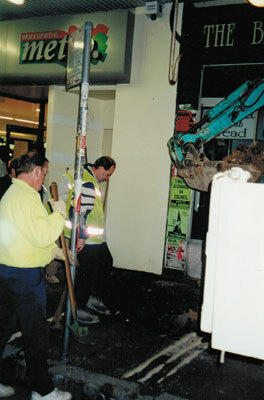 In 2000 the footpath was repaved, with synthetic bluestone pavers replacing the asphalt. Before the works commenced the plaque was removed. But in the place where it had been glued to the footpath, somebody wrote an impromptu memorial to Black Santa in red chalk. 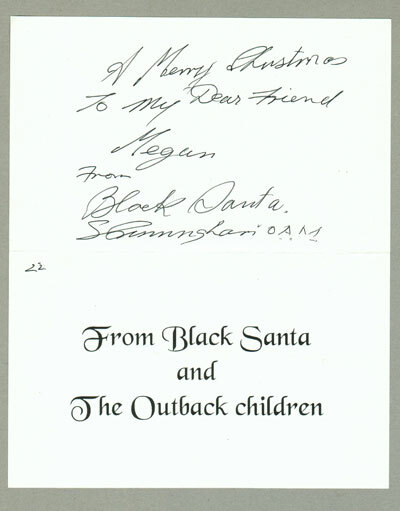 ‘The Black Santa Claus’ hand-drawn plaque, 2000. 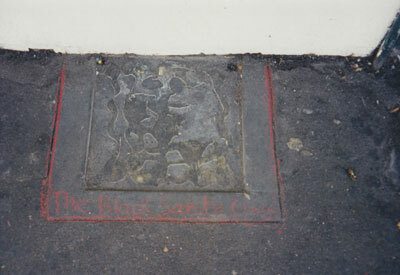 After the repaving was finished, the original plaque was reinstalled, and it’s still there today. The supermarket itself has changed hands a few times. Currently it’s an IGA. 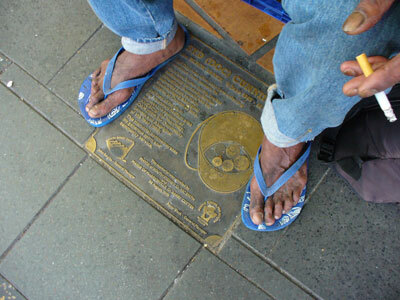 And Syd’s plaque has become the focal point for beggars who keep his memory alive by collecting for themselves. Syd Cunningham plaque, long since reinstalled, 2008. Funny thing though. Just a few days ago, someone wrote a post about the plaque on the Republic of Newtown Facebook page, adding, ‘ Sadly, the plaque was removed when the footpath was resurfaced’. Somehow this person had failed to notice that the plaque was put back fourteen years ago. That Facebook page got many comments and even though several noted that the plaque was still there, quite a few comments demanded that the plaque be replaced. Sentimental indignation prompted by misinformation. It happens. The plaque in the same place, next to the IGA supermarket, December 2014. 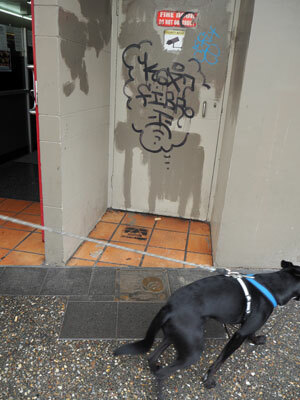 All photos of this spot in King Street are from the Pavement Graffiti archives by meganix. 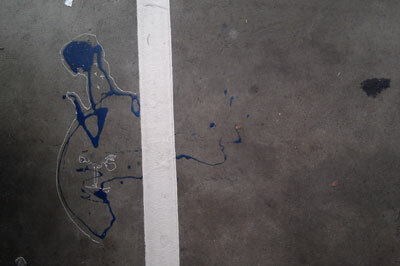 Paint splash, Botany Road, Redfern, 2013. Photo by meganix. Glossy black dance floor or ashen skin or something else entirely? The asphalt pavement stirs the poetic imagination of some writers but the hard truth spoils the romance of the blacktop. It was Vladimir Nabokov who wrote , ‘Voraciously we consumed those long highways, in rapt silence we glided over their glossy black dance floors’. 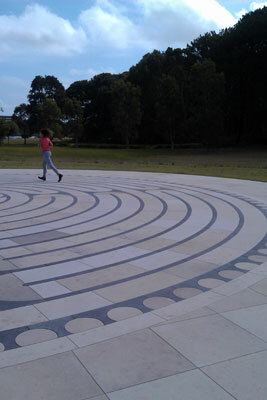 Australian author Jessica Anderson says of one of her characters, ‘… in her visual memory of Sydney as a city predominantly blue and green and terra-cotta, there had been an element missing. And here it was, this ashen skin covering not only the road, but the footpaths as well’. Unfortunately that dark covering is making Sydney hotter because it absorbs heat and radiates it back out. Sustainability campaigner Michael Mobbs has the figures to show that suburbs with black roads and few trees suffer badly during heatwaves. 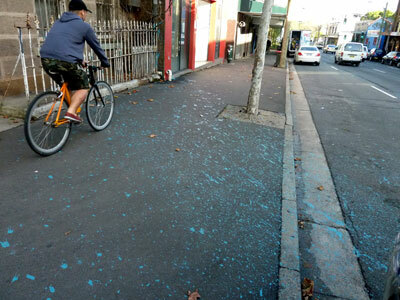 It’s called the urban heat island effect, and to counter it the City of Sydney is conducting trials in Chippendale using lighter-coloured surfaces on some roadways. The pale pavement is open grade asphalt filled with concrete slurry. 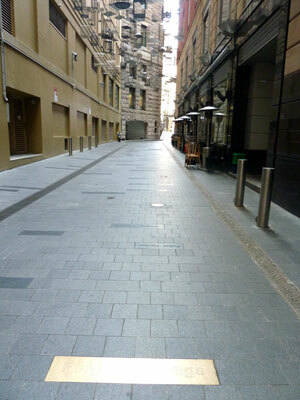 Pale pavement, Chippendale, 2014. 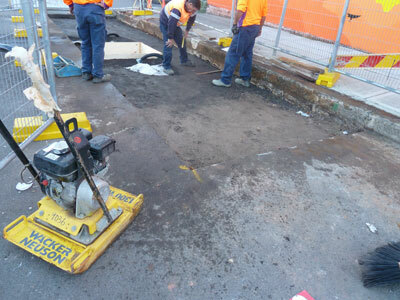 Image from City of Sydney website. Mobbs has been monitoring the trial. He says it reduces the temperatures by two to four degrees on a hot day, and predicts that during heatwaves there may be six to eight degrees difference. Death rates rise in cities during heatwaves, so that difference could save lives. Glary though. Jessica Anderson. The impersonators. 1980. 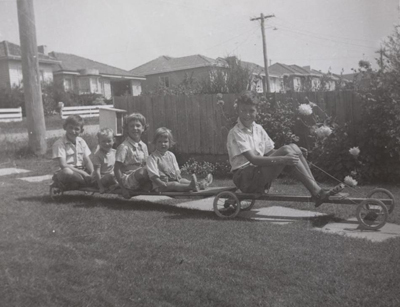 Children on a billycart with a trailer in the Melbourne suburb of Mount Waverley, 1961. When I need a laugh I pull out my copy of Unreliable Memoirs by Australian ex-patriot polymath Clive James. The whole book is funny but one of my favourite passages involves concrete footpaths, billy carts and rubber tyre marks. Oh, and poppies. 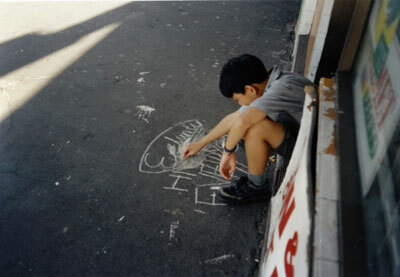 The pavement often appears in people’s reminiscences of childhood. This is not remarkable, especially if they lived in inner city areas when they were young. After all, children are close to the pavement and playing on it is an everyday experience – or at least it was when children had more freedom. There were games like hopscotch and chalk chase that needed to be marked out on the hard surface, rhymes and chants about avoiding the cracks (or break your mother’s back), and hot sticky bitumen roads that were torture to cross in bare feet in the summertime. Even in the sprawling suburbs where spacious backyards were the norm, streets served as a communal playground for ball games and competitive races that could only be staged on paved surfaces. Clive James played with neighbourhood kids on the footpaths of Kogarah, a suburb of Sydney. James has been in the news lately. He is suffering from a terminal illness and The New Yorker has published an emotional new poem written by him as he contemplates his death. Also this fortnight there has been the two-part documentary Brilliant Creatures: Germaine, Clive, Barry and Bob on ABC-TV. So as a tribute to him I reproduce here an excerpt that introduces the episode of the billycarts and poppies. If you haven’t already read the book – or even if you have – I recommend you track down a copy. Other children, most of them admittedly older than I, but some of them infuriatingly not, constructed billycarts of advanced design, with skeletal hard-wood frames and steel-jacketed ball-race wheels that screamed on the concrete footpaths like a diving Stuka. The best I could manage was a sawn-off fruit box mounted on a fence-paling spine frame, with drearily silent rubber wheels taken off an old pram … Carts racing down the footpath on the far side had a straight run of about a quarter of a mile all the way to the park … Carts racing down the footpath on the near side could only go half as far, although nearly as fast, before being faced with a right-angle turn into Irene Street. Here a pram-wheeled cart like mine could demonstrate its sole advantage. The traction of the rubber tyres made it possible to negotiate the corner in some style. I developed a histrionic lean-over of the body and a slide of the back wheels which got me round the corner unscathed, leaving black smoking trails of burnt rubber. Clive James, Unreliable memoirs, London: Picador, 1981.
bill bisset is an experimental Canadian poet whose work attracts both praise and controversy. 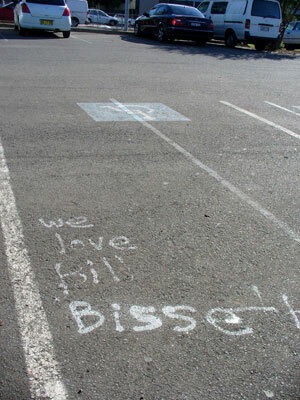 This photo was taken in the carpark at Sydney Park, St Peters (2010). Pavement writers love poets, and poets love pavement writers. 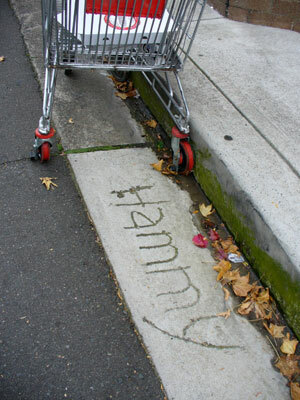 A blog about pavement graffiti might seem a prosaic sort of thing to write, but I am in good company. There are plenty of poets who have found inspiration in the marks on the paving. For poets these marks are associated with memories of childhood life, expressions of the inner life, the playing out of private life in public, and the sordidness of life in the gutter. We could begin again. Pick it up. 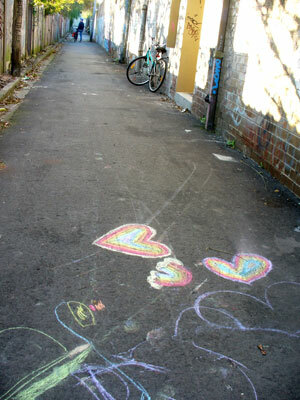 A back lane in Newtown (2008). And shook to hear, but say it he could not. On the street where you live, Marrickville (2010). 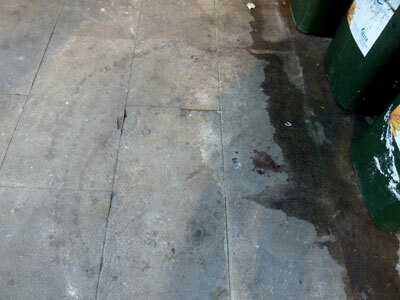 Blood on the flagstones, King Street, Sydney (2011). argues and pleads all day with the parking meters. This is a story about the struggle between the green and the grey, between leaves and asphalt, between street trees and street parking, between what ought to be and what is. 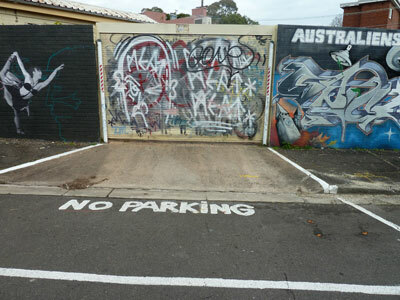 In inner city suburbs like Enmore and Stanmore, Marrickville Council is caught in this struggle. 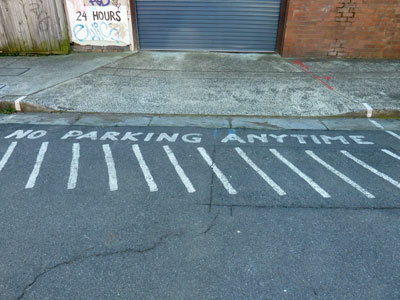 One of the most stressful aspects of urban living is the shortage of parking. Suburbs that sprang up in the Victorian era, when there was no such thing as a motor car, are now undergoing gentrification; households often have more than one car but few houses have off-street parking. Given the convenience of public transport in area, why do these people need cars? Partly it’s snobbery. Does your solicitor join the plebs on a bus to work? Would your doctor be seen dead in a train? Partly it’s necessity. With both parents working, try juggling work hours, childcare drop-offs and pick-ups, and Saturday sport all over the city. However much people might agree in principle with the environmental benefits of public transport and bicycle riding, often these are just not viable options. Shortage of street parking spaces is made worse by visitors to the area. Now that Enmore has become a ‘vibrant entertainment precinct’ hundreds of customers come in the evenings to attend performances or enjoy the many new restaurants, bars and cafes. And they don’t necessarily want to travel across the city in public transport at night to get home. So they infiltrate ever-deeper into residential territory to find parking for their cars. Residents jealously guard driveways (if they have them) and fume when they have to park blocks away from their homes. Marrickville Council knows all this and is trying to address the problem with committee meetings, surveys, community consultation, plans and projects. Enmore, 2014. Enmore Theatre is in the background. 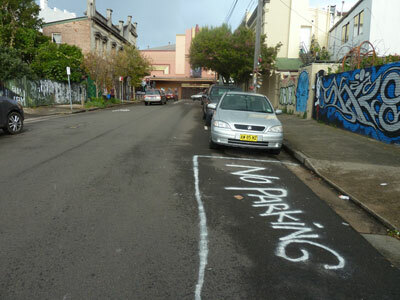 So why is Council intent on reducing the amount of parking in contested areas, rather than finding extra spaces? It’s because they are also committed to an Urban Forest Strategy that ‘recognizes the urban forest as an essential, living infrastructure asset and resource that provides a wide range of social, environmental and economic benefits’. 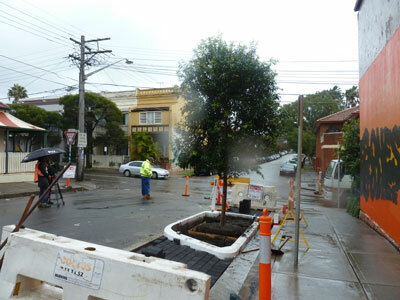 And this is what has prompted the demonstration project in Cavendish Street, Enmore, where large Lilli Pilli trees have been planted in structured soil in the roadway. I wrote about this project in my earlier post ‘What lies beneath’. And even though ‘permeable paving’ means that the space taken up by tree-planting ‘blisters’ is smaller than would normally be needed to keep trees healthy, there is no question that parking spaces have been lost. Residents of the street are supposed to have agreed to this arrangement, but they probably would have agreed to any scheme that saw the former huge, inappropriate and destructive fig trees removed from their footpaths. Enmore, 2014. One tree gained, two parking spaces lost. 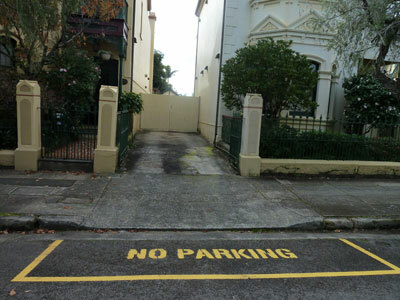 Meanwhile parking pressure on nearby streets has been increased just that bit extra. What’s more, Marrickville’s draft Master Street Plan has Lilli Pilli (Waterhousia floribunda) or similarly large trees slated for some of these same streets. Given the narrowness of the verges, this must mean more in-road planting and more parking lost. Residents of these streets are not going to be too happy about this. A 2013 survey of residents in the Marrickville Local Government Area found that most people like having greenery in their suburbs. Of course. But what the survey doesn’t mention is that householders also like to park close to their homes and businesses don’t want customers put off by lack of parking. Until a whole lot of things in the world change, this reliance on cars and the need for parking isn’t going to go away. In-road planting is an impractical component of the urban forest strategy and would have measurable social and economic costs. An ideological commitment to such a component would have a detrimental, not a beneficial, effect on the local area. Small trees, please. 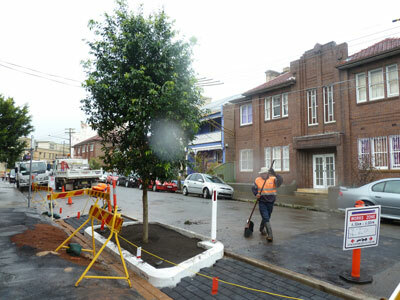 New trees have been planted in Cavendish Street, Enmore, but for pavement fanciers the interest lies in the method used to install them. The process was far more complex than simply plonking a tree in a hole. 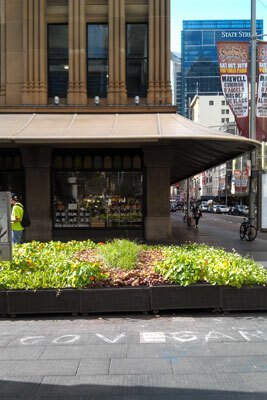 It involved such things as ‘in-road planting’ and ‘structural soil’ and ‘plastic cells’ and ‘permeable paving’ – all designed to address ‘multiple issues, including impact of trees on infrastructure, safety of footpaths, enhancement of the urban tree canopy, landscape amenity and urban water management’. * And preventing the road surface from cracking or caving in. 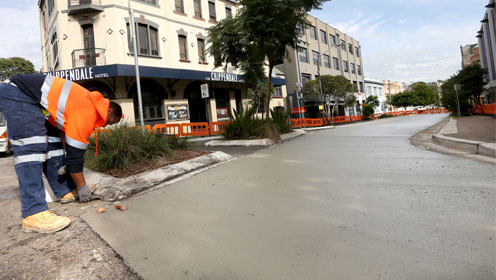 Marrickville Council seems pretty pleased with the project, which is the first of its kind for this municipality, and maybe for the whole of Sydney. It’s been interesting watching the process, but I have some misgivings. 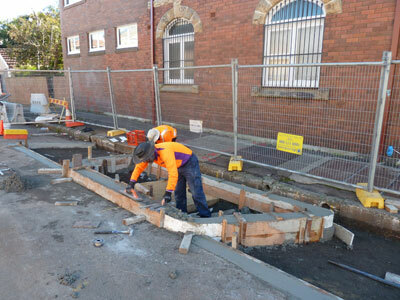 It all started more than three years ago, when Marrickville Council began removing very large fig trees from the footpaths on the street. Although enjoyed by birds and bats, these trees broke up the paving and invaded underground pipes. I wrote a blog post about local mourning when the first tree was removed. The story resumes in April this year, and here’s how it goes. 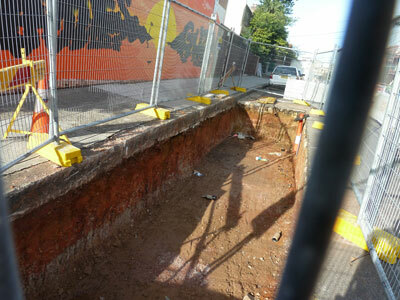 The Council excavates three huge rectangular pits in the street, digging deep down into the clay beneath the surface of the road. Underground infrastructure, including gas pipes, is adjusted and gravel is spread in the bottom of each hole. 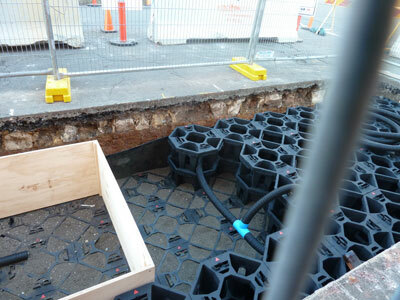 Next, a layer of large plastic cells is positioned in the pit and ‘structural soil’ is tipped in between them. Another layer of cells and soil is added, this time with a rectangular hole in the centre fenced off with plywood formwork. As I understand it, the plastic cells act as support for the roadway above; the structural soil is a mix of gravel and loam that resists being compacted and allows tree roots to spread and grow. Over the soil comes a layer of geotextile then another layer of gravel. 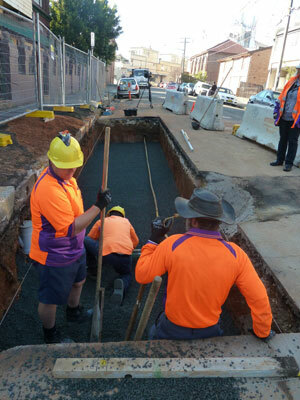 Concreters build retaining edges around the central tree hole to form a ‘blister’. This will prevent cars bumping into the tree trunk. Permeable pavers are laid. Rain falling on the road will flow towards this area of porous paving. 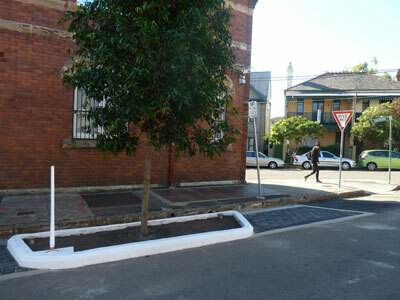 This means that street run-off will infiltrate the tree pits instead of gushing down the gutters and into stormwater drains. Within a day or so, on a nice rainy morning, advanced trees are lifted into the central hole, the formwork is removed and more soil is tipped around the large root ball. The three trees are Waterhousia floribunda ‘Green Avenue’, a cultivar of the rainforest Weeping Lilli Pilli that is expected to grow to 16 metres. Cavendish Street, June 2014. All photographs by meganix. The project is not quite finished. A garden will be planted inside each blister. But the safety fencing has been replaced by witches’ hats and the official photographer has been sent to take photos for Council publications. As the unofficial photographer and busybody I’m rushing into e-print with this blog post. In my next post I will talk about how my admiration for this aboricultural and civil engineering feat is tempered by reservations about the push and pull of local council policies. *Marrickville Matters, December 2013, p.9. 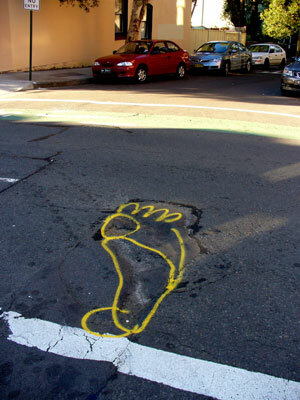 Pavement graffiti explores the strangeness of the everyday urban landscape.